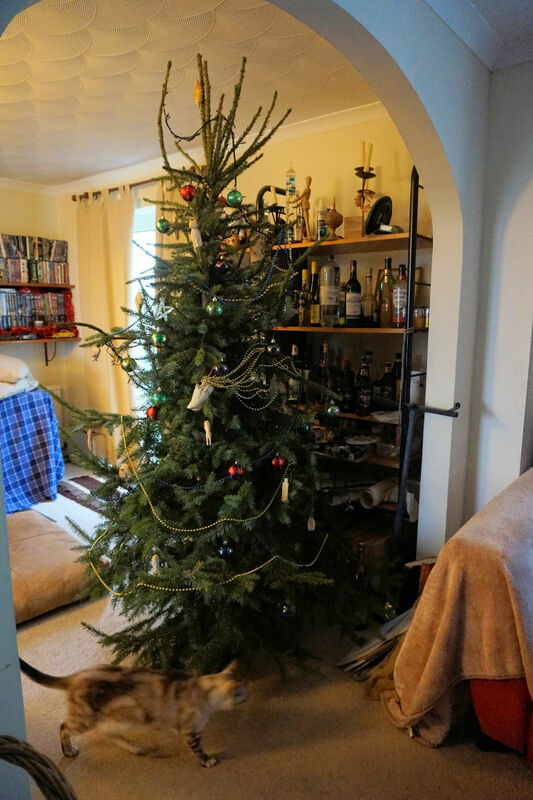 It's been a few years since we went out and bought a Christmas tree, but this year we went out into the garden and found that it had been gardened so thoroughly that there were no reasonable-sized holly trees left. So we bought this fir tree - I think it's a noble fir. I feel faintly guilty, although really it is no different to buying, say, a cabbage. Fortunately, the cats are all old and staid now, so I don't have to worry too much about them climbing it. 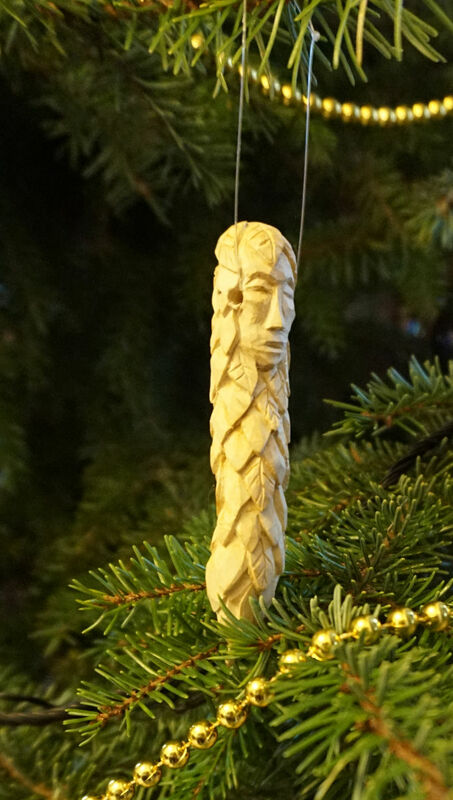 I *thought* that I had not made a carving from last year's tree, and that I had just slung a chunk of tree into the decorations basket, thinking that I would carve it next year. Which seemed like an annoying decision from the perspective of now, because in general, I prefer to carve wood green, it's much easier to work and not so hard on the thumbs that way. Admittedly there's always the risk with carving green wood that it might split as it matures, which is very annoying when it does happen, but I find it worth the payoff of easier cutting. 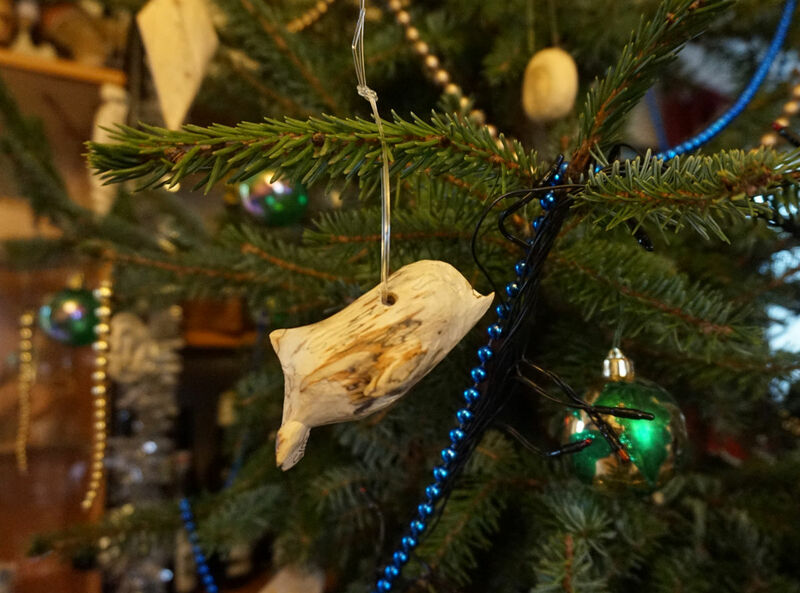 Anyway, I didn't want to miss a year's carving, so I took the dried chunk of last year's holly and worked with it a bit, and after a while, I found that I had made this little porpoise. It was actually quite an interesting exercise, because although the wood was rather hard, the shape of it had a lovely wiggle to it, and also the texture is lovely because the wood seems to have picked up some small fungus in the loft before drying out, and so is much more interestingly veined and marked than holly usually is. You probably can't pick it up from a photo, but the wood is very smooth and hard and veined and quite tactile. And then when I was getting out my drill to drill a hole (and finding that I had snapped my smallest drillbit and not replaced it, annoying! ) I found this lurking in my toolbox. And I remembered that actually I had decided that it would be annoying to leave the carving for December, when I'm often busy, so I carved a little Green Man, back in January. And here he is! So, 2015 has turned out to be the year of two carvings and I still have a chunk of this year's tree that I need to work on. Ah well. That is a nifty thing, to make a decoration from the previous year's tree. If we did trees I would totally steal that idea, but we got a cat tree so then there was nowhere to put the holiday tree. At this point I think the extent of our holiday decorations are the Hanukah lights on the front window that I forget to take down, because the curtains hide them, and the Hanukah rubber duck on the top of the Spouse's monitor. I stole the idea from the Dark is Rising books... I've been making them for years now, so we are starting to amass quite a good collection, even though they are a bit random in terms of size and subject matter. When I was a child we used to have an ornament crafting day in the weeks before the holiday, in which we would make ornaments from kits. My admittedly fuzzy memory says they were usually styrofoam balls stuck with pins with beads and spangles threaded on them. The ornaments are probably in a box in the storage unit, along with all the rest of the holiday trimmings that we kept. The Green Man looks quite Aztec to me. You have a really funky ceiling. I love that ceiling! Every time a plasterer or someone in that sort of line of work comes to our house they look at that ceiling and tut at it and ask if we are planning to have it skimmed to a trendy flatness, and I say NO! I LOVE THE CURVY CEILING! They usually live plasterers perplexed for a while too after they see them. Ouch, those walls look like they would be very painful to lean on! Yep. They bought the place with those walls there and never did away with them. 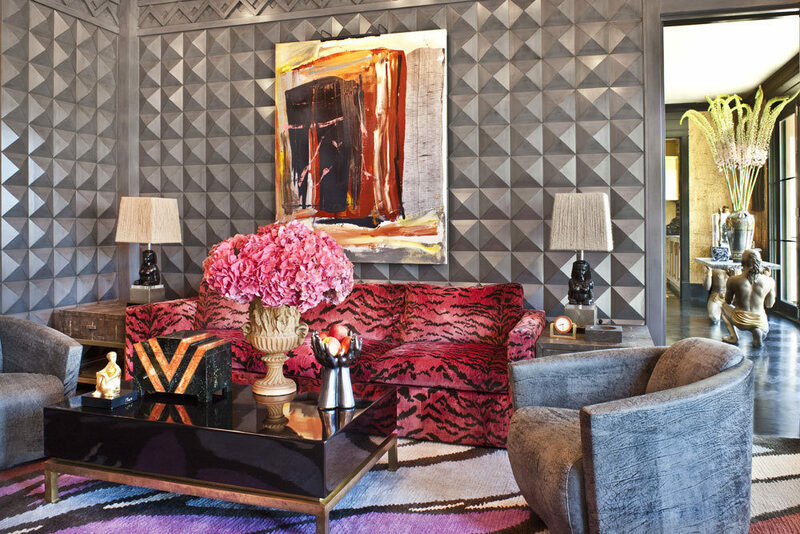 I would imagine a plasterer would have a hard time concentrating on any conversation not related to those walls in that room. That ceiling is quite unique--I love it. It has Character. That Green Man carving is beautiful. Oh, I love the little porpoise. But the Green Man is absolutely stunning. You are very good at carving. If I remember rightly, I went for a Green Man because I've carved one of those years ago and Pp always says it's his favorite. This little one is less impressive though, but it was surprisingly quick to make. The leaves are quick to carve. The little porpoise would be very satisfying to hold, I think. The Green Man's leafy cloak and cap are intriguing. Hiw do you approach carving? Do you make a drawing first? Houses used to have whole facades plastered like your ceiling here, done by specialist workers from China It is incredibly rare and precious now, and impossible to restore unless you are rich enough to ship the workers from China (assuming you can find any with that particular skill). I am so impressed by your self-carved Christmas ornaments! My family used to have small, live Araucaria trees for Christmas, which were then moved outside for the rest of the year until the next Christmas. In our climate, Araucaria trees grow appropximately 30 cm a year...once they got too big to fit under the roof they were planted out to form (over the decades) a very tall hedge. Then we got cats, and moved to the abstract-form tree concept i.e, a large dead branch hung on the wall and decorated. In my own house I have taken it to the next level, since my cats are still young and bouncy, and hang decorations on the metal chandelier in my hall. I don't know why the plasterers are so disapproving. You'd think they'd like to see an interesting variation on their art, but I get the impression they think it is fussy. I don't remember us having that much trouble with the cats and tree even when they were young and feisty, but it may be that I've blanked it out! We changed after the spectacular incident in which our then-Senior Cat, who was huge in his day, nearly 9 kg, decided that he wanted to climb the tree, and brought the whole thing down. Luckily, onto the carpet, so the breakages were not as extensive as they might have been.